Baptized at St. Barnabas Church on January 22, 1967. I grew up in a Precious Blood Parish (St. Barnabas). In many ways I fell in love with the Spirituality first. I was an active member of the parish, and became a Companion (lay associate). 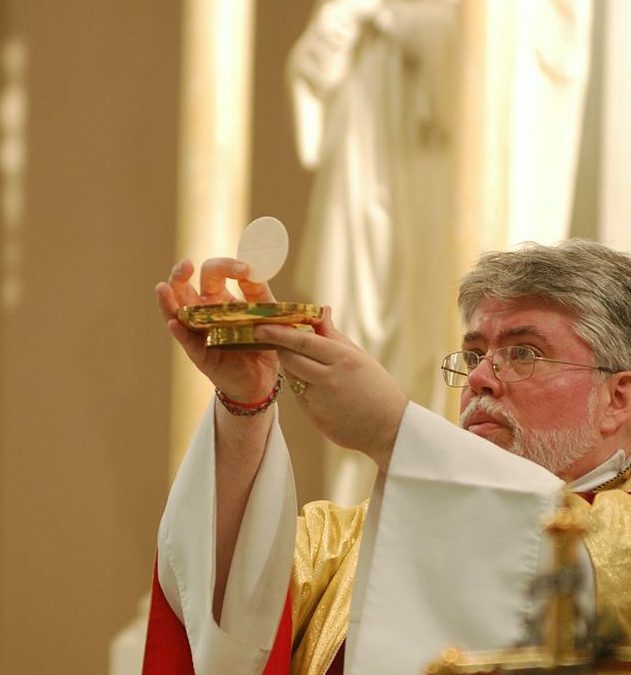 It was several years later when I finally realized that God was calling me to be a priest. The other piece for me is the relationship I had with the men over the years. I remember Fr. John Klopke, C.PP.S., growing up, who I always remember as a very human/very funny man. Others over the years who influenced my joining would be C.PP.S. Frs. Gary Luiz, and Jeff Keyes. I currently serve as our Vocations Director. Among other things that means I have the privilege of working with the young men who are discerning whether or not God might be calling them to life as a Missionary priest or brother. I meet with them and help them as they struggle to figure out who it is God made them to be, and to find their best path to holiness. I get to be a part of a variety of youth and young adult events and rallies as well as visit a wide variety of parishes. It is always a joy to experience the width and breadth of the Church. Hands down the most rewarding thing I get to do is celebrate the Sacraments, particularly Reconciliation and the Eucharist. Because I am not assigned to a particular parish, I get asked to help with Reconciliation at High School retreats a lot. Hearing Confessions is always an honor and a humbling experience, but on retreats, these young men and women have had a chance to reflect on where God is calling them to Conversion in their lives and relationships. It is such an honor and a grace that I get to be there for those young people. I managed restaurants for about eight years after college. Before I discerned my call, my plan was to eventually open and operate my own restaurant. I enjoy cooking and love watching people enjoy my cooking I’ve worked every position there is in a restaurant from dishwasher to bartender. Sitting on the porch and reading, Archery, movies. Although sometimes, the best thing to do is nothing. Aside from St. Gaspar, what are some of your favorite Saints? St. Lawrence the Deacon, Patron Saint of Chefs, mostly because he was a bit of a snark. St. Maximillian Kolbe, because of his incredible bravery. Jesus Christ, Son of the living God, have mercy on me, a sinner. These are tough to answer. Book: The Narnia Chronicles: Voyage of the Dawn Treader by C.S. Lewis. Food: I’m a fan of Breakfast: Chicken Fried Steak and Eggs with gravy, oh and crispy potatoes. Departures is a wonderful Japanese film I stumbled on a few years ago. House of the Flying Daggers is a visually stunning Kung-Fu movie. Spanglish, the last line of the movie is amazing. Willy Wonka & the Chocolate Factory (1971) although the boat scene is really creepy. A Christmas Story “You’ll shoot your eye out”. Holiday: Thanksgiving, it is the one holiday that we all (in the USA) celebrate together. Oh and Black Friday is an abomination! TV Show: Diners, Drive-ins and Dives. At one point in my life I wanted to own my own restaurant, and these are the kinds of places I would have wanted to operate. How much money would you earn on Jeopardy? Snorkeling – I see no reason to jump out of a perfectly good airplane.